Despite the students across the way being quiet since we’ve been in Nottingham we decided to move away for the weekend. It would also give us a change of scenery. Before we could move off we had that triple nectar points voucher to use at Sainsburys. To our surprise we were down to our last box of wine, despite us having two alcohol free days a week since the start of January. So a biggish shop was done, extra points added to our account. Did we get a voucher? Yes …. but for home and car insurance! They obviously haven’t been fooled by us this time and know we’ll be back next week when they will give us another triple point voucher. With everything stowed we had lunch and then pushed off. We’d originally thought of winding and going back out to Beeston, there had been space there with the winter moorers but the proximity of the road would make me reluctant to let Tilly out. 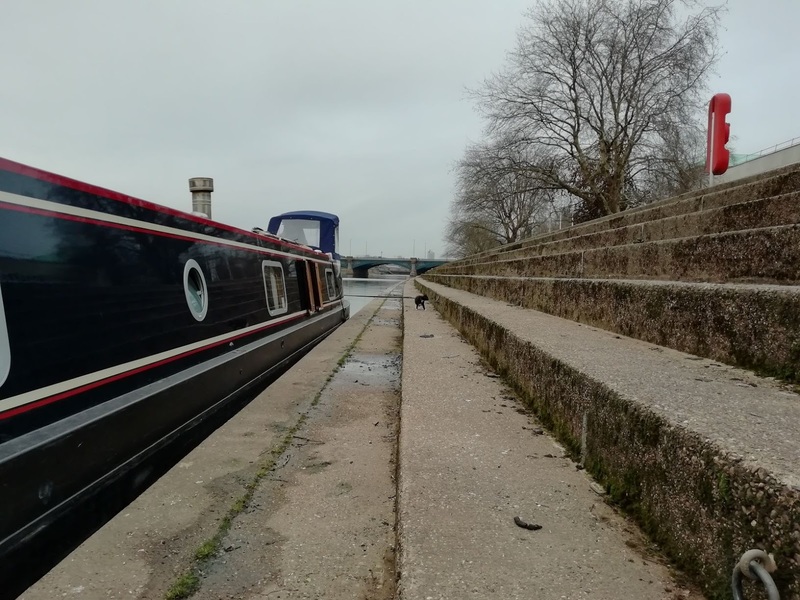 There is space closer to town where she’d be fine on the towpath apart from the cyclists. 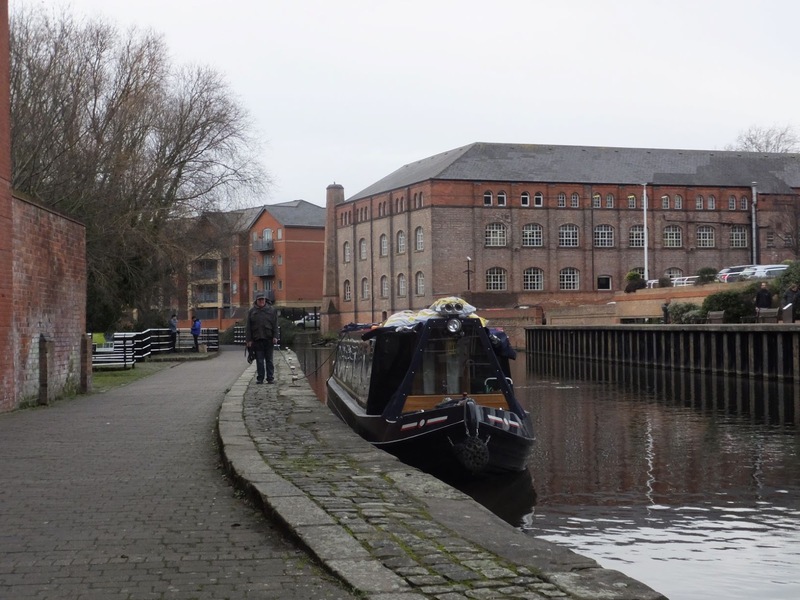 In the end we decided to head down Castle and Meadow Lane Locks back onto the river and moor at County Hall steps. The river having behaved itself shouldn’t cause us problems and it is away from the road there so Tilly would be allowed out. Not quite enough layers on meant we got a touch chilly heading through town, we were glad the stove was glowing inside keeping Tilly nice and warm. Station Street Bridge, just after the big 90 degree bend looks like it used to be a roving bridge. 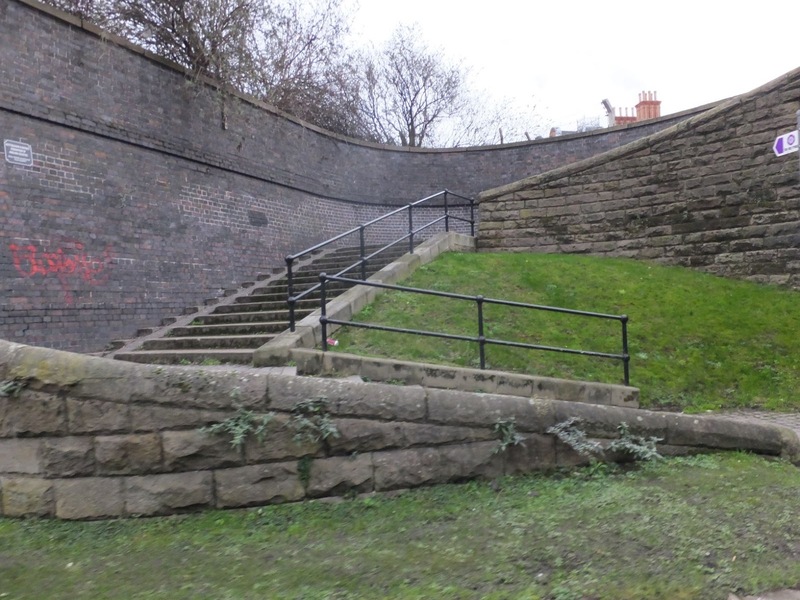 It still is, but has had part of it’s curving wall removed and steps have replaced the slope. A new section of railway bridge was being slotted in between two older bridges near the station. 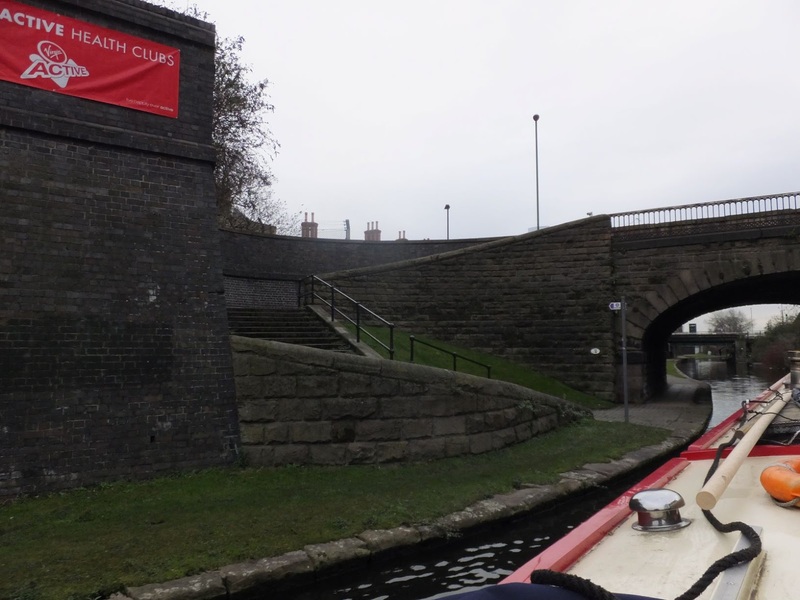 Above Meadow Lane Lock we disposed of our rubbish before descending. I could see that there was plenty of space for us down on the steps so once back on board we swept round to face Trent Bridge, passing under it and on towards the steps. Two cruisers and a widebeam were moored up, so we pulled in at a good distance away from the bridge and car parks some distance behind the other boats. The flow of the river meant the bow was constantly wanting to pull outwards and the distance between rings meant our ropes would be tight, not a good thing on a river. So we repositioned ourselves so we had some spare rope. 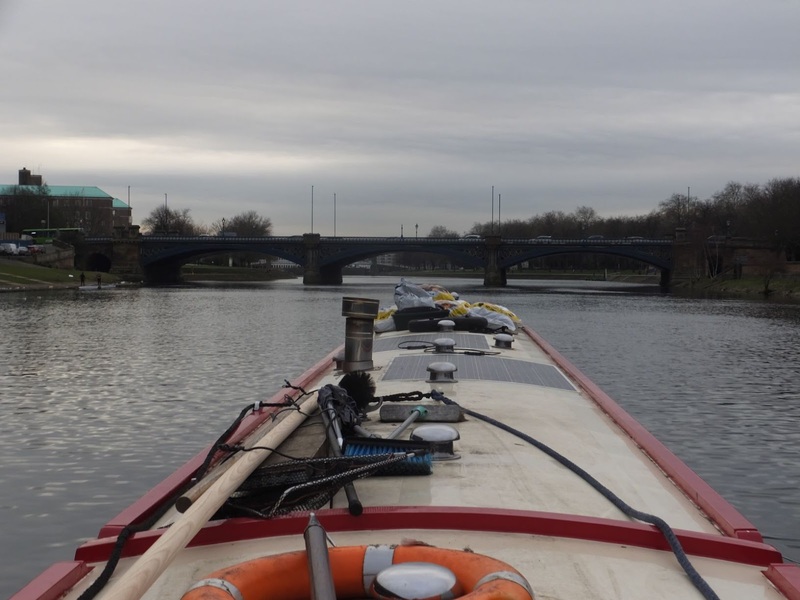 As soon as we were happy with everything the other boats pulled out, winded and headed towards the lock, maybe we smell! This outside has a wall, but no ordinary wall. The blocks are big and they can walk up them, I have to jump them one at a time to get to the top. Across the elevated towpath there are good sideways trees, but far too many bicycles to get there. This all made me quite panicky as waiting at a safe distance for a gap meant the people had no legs, some of them no bodies only heads. What sort of outside is this!?! 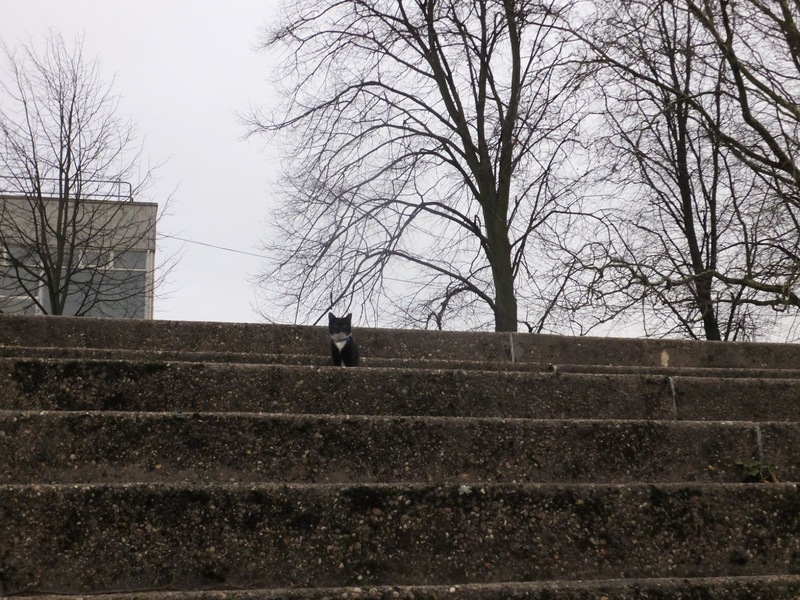 Giant steps or little cat? Tilly ran back and forth in quite a tizz before eventually she plucked up the courage and went to check out the sideways trees. She wasn’t there long. During this evening the rowers have subsided in number but been replaced by very noisy teenagers just above our mooring, They all must be very deaf! 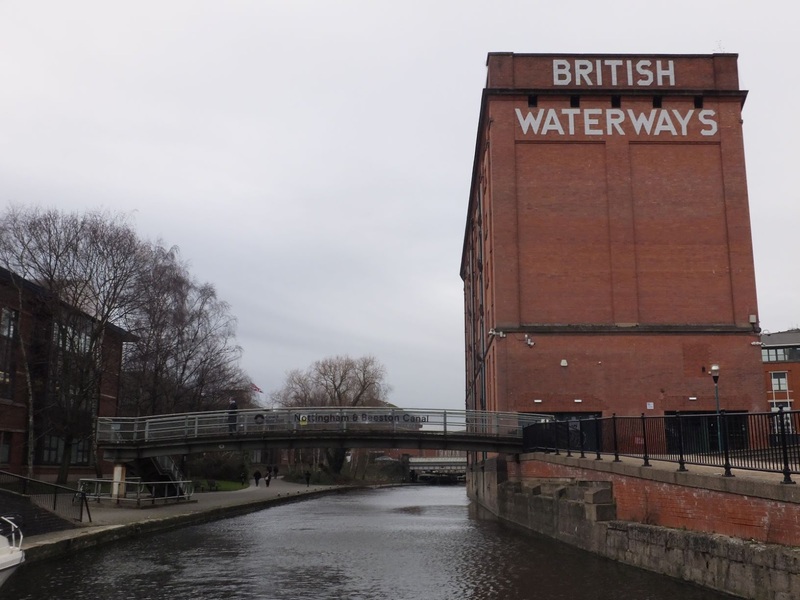 2 locks, 2.4 miles, 6 boxes, 1 useless voucher, 90 degree bend, 180 degrees onto the river, 8 giant steps, 1 little cat, 3 rowers, 17 VERY NOISY teenagers. This entry was posted in Uncategorized on 20th Jan 2019 by pipandmick.